Steven Abbott Associates LLP have appointed Bryanni Cartledge to a new role of Planning and Development Graduate. Bryanni joined the practice in October 2016 after graduating with BSc Geography (Hons) from Lancaster University. 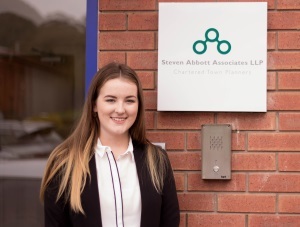 Bryanni will primarily be based in Steven Abbott Associates' head office in Appley Bridge, Wigan but will also be involved in projects run through their Kendal office. Bryanni has previously worked as an Environmental Officer for a Lighting Design Consultancy in Warrington where she provided background research for ecological surveys to be submitted as part of Ecology Reports. "I am looking forward to developing my knowledge and experience in planning with the help of the great team at Steven Abbott Associates"
Her new role as Planning and Development Graduate at Steven Abbott Associates will involve planning support duties in the form of researching information and planning history searches, keeping up to date with planning legislation and policy, assisting with the preparation and submission of planning applications and appeals and developing her own caseload. "We are delighted to welcome Bryanni as the newest member of our planning team, and we are confident that she will make a valuable contribution as she supports the team in their work to deliver the highest standards of service to our clients"
For further information on Steven Abbott Associates LLP's expert team and the services provided please contact us on 01257 251177 or via email.